This week’s Waiting on Wednesday post is yet another book that I am not only dying to get my hands on, but also crossing all my fingers that I might be able to snag an ARC copy of at YALLWEST this weekend! Marie Lu’s Warcross will be out in September, and it sounds AWESOME. A high-tech, gamer fandom and a hacker who also happens to be a bounty hunter/spy? I mean, seriously! How cool does this book sound?! You’ll find me sipping on this Player I Syrah from 8 Bit Vintners while reading Warcross when it comes out in September. 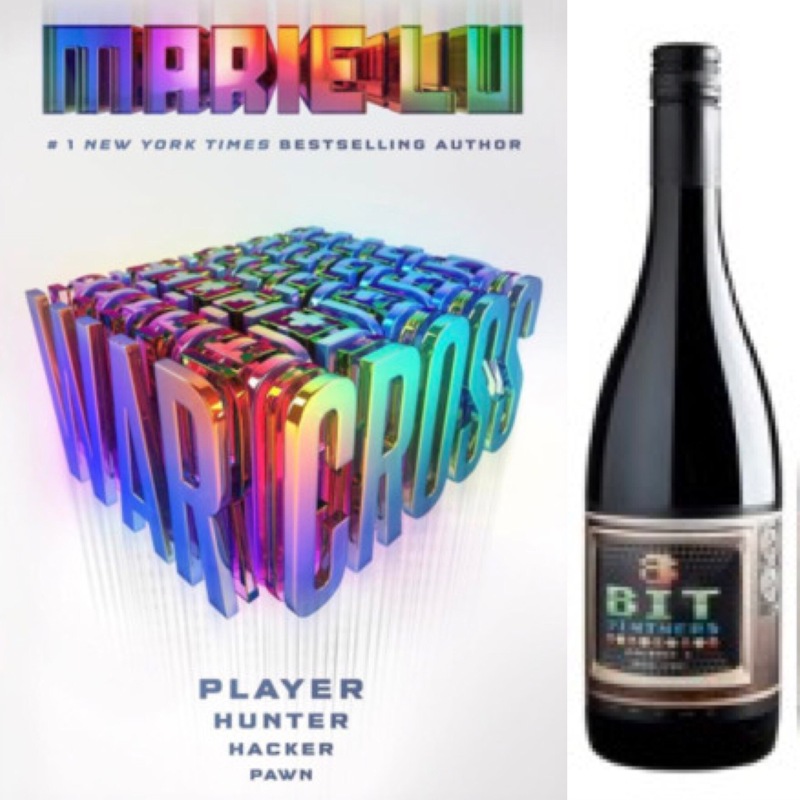 Not only does this gamer-themed wine pair perfectly with this gamer-themed book, but the dark, fruity flavors also match the unexpectedly dark and corrupt world Emika may discover lurking beneath the surface of her favorite game. How excited are you to read Warcross? Have you read any other YA novels that feature gaming? Are you a gamer as well as a reader? Illuminae Paperback Review and Giveaway! Have fun! I really hope to go to BookCon but I’m nervous about NYC. If I get an ARC I’ll probably just die of excitement, so I’ll bequeath it to you. 😉 I hope you can go to BookCon! NYC is awesome! Awww! That’s so cute! If you do get your hands on anything extra or unwanted somehow, I’ll pay to get it to me. Same goes for me and BookCon. I kind of have to go bc Fernanda bought tickets already! So I’ll have to figure out something! I have some swag for you, too! I need to go through and see what you want since you sent me some too! Hahaha! I love that you said you kind of have to go to BookCon. BookCon would be AMAZING! Maybe next year. 🙂 My mom and the hubz are coming with me. We’re diving and conquering a lot, but if I get extras, I’ll def let you know! I can’t wait for this! I’ll be keeping my fingers crossed you get an ARC Krysti! Thanks, Kim! I’ll need it. It sounds like there will be a very limited number of ARCs. It just gets hard when it’s like, do you stand in line to get books signed by authors, or do you go after those ARCs! And forget the amazing panels they have going all day! This book sounds totally awesome! It’s a great Waiting on Wednesday pick! Thank you! It does just sound like such a cool book! Ooh, perfect pairing! 🙂 Good luck with that ARC! This one sounds like it’s a lot different from the Legend trilogy, so I’m really excited to see what Marie Lu has come up with. She seems to be one of those writers that can write just about anything REALLY well. I’m really excited for this book, it sounds so cool! I’m hoping for an ARC and can’t wait to hear if this book lives up to my hopes! It does sound cool, right? I think that is the perfect adjective to use from the book description. I will keep my fingers crossed that you get an ARC too! Definitely let me know if you do, so we can chat about it. It is amazing the different kinds of wine I have discovered since starting this blog. There is a wine for just about everything, which is awesome! This book does sound good and just plain COOL. Thanks so much, my friend! Haha, probably not, since we live in UT. We miss out on A LOT of great wines. This sounds really cool. And I love the cover; it’s so vibrant. It is such a unique and fun cover. Can’t wait to see what’s inside! Ooooh. I haven’t read anything by Marie Lu yet, but this sounds right up my alley. I really loved Ready Player One by Ernest Cline, but I haven’t ready any gamer fiction since then. This is now on the TBR! Any other gamer-fiction recommendations? I adore Marie Lu! I didn’t snag this one at YALLWEST unfortunately. They only had five copies there, so they went like wildfire. The only other gamer fic I’ve read is Bluescreen by Dan Wells. Dan’s a local author here, and I enjoyed that one. The sequel just came out this year, but I haven’t gotten to it just yet. Hopefully soon!